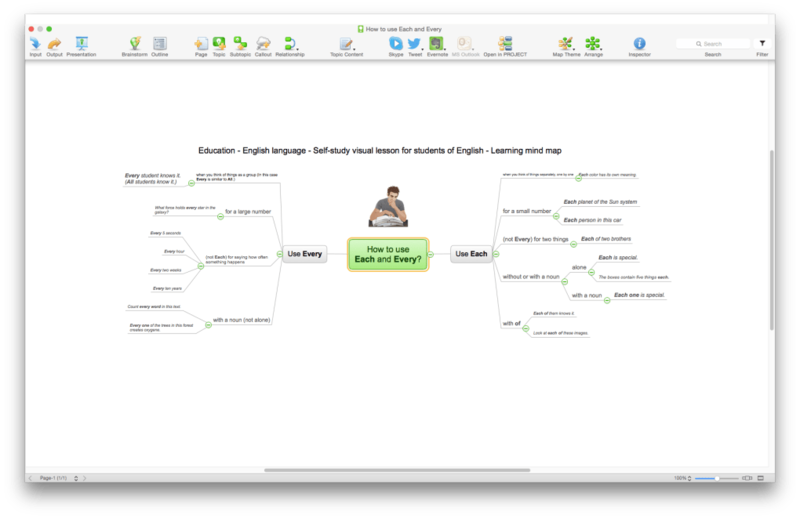 ConceptDraw MINDMAP offers a variety of outputs, making it easy to share map content in the appropriate format. Creating output is simple; just one click allows you to output to other applications, such as Microsoft PowerPoint and Word, as well as ConceptDraw PROJECT and ConceptDraw PRO. You can generate text and tables that are pertinent to your work. The output capability of ConceptDraw MINDMAP unlocks the information in your maps to build documents. With one click, you can communicate status, update tasks, write articles, and build presentations from your map, choosing the appropriate document type and template. For example, you can generate a task list with one click. Helpful copy and paste capability built into ConceptDraw MINDMAP can be used to manage spreadsheet data from MS Excel. Data can easily be moved from one of the applications to the other by using copy and paste functionally, preserving data structure as data is transitioned into a different visual format.